It’s my pleasure to welcome back one of my favourite writers and a really fab chick, Justine Elyot. Justine is here with the story behind her Secret Library novella, Hungarian Rhapsody from the anthology for which it’s the title story. Ahh, Budapest. The obvious setting for my Xcite Secret Library novella, Hungarian Rhapsody, for after all, haven’t I strolled its boulevards and admired its attractions on many occasions? Actually, no. I’ve never been to Budapest. So what possessed me to set a story in a city I’ve only visited in my imagination? I think it was the chance to ‘live’ in that city, even if only virtually, that drew me towards the idea. I spent a long time on tourist sites and all kinds of other interesting byways. Youtube, for example, has some fascinating documentary footage of life in Budapest in the 1950s and 60s, to which I became quite addicted. So I thought today I’d do a little guide to those city locations that are featured in the story. 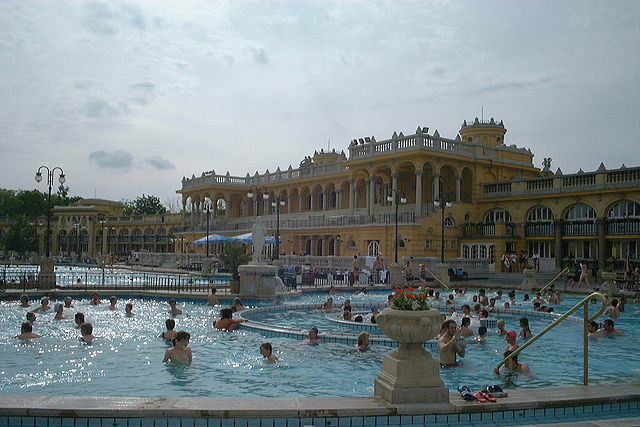 I’m starting with the Széchenyi Baths. Oh, how I long to visit these… I mean, look at them. Later in the tale, Ruby fends off a hangover with a day’s sightseeing. 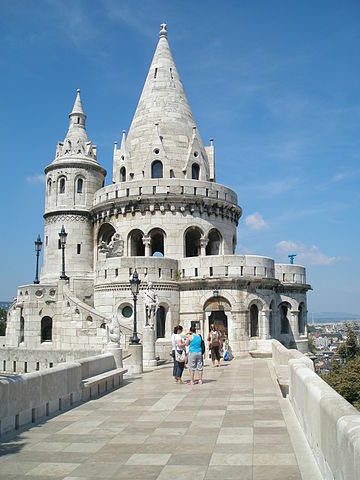 János takes her to the Fisherman’s Bastion in old Buda and promptly invents a tradition that involves kissing. Cheeky whatsit! But a kiss in the Fisherman’s Bastion must be worth several anywhere else. János’ ambition is to buy up a decaying old Budapest courtyard and turn it into a fashionable bar. 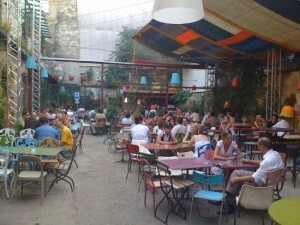 Romkocsma (ruin bars) like Szimpla Kert have been popular in the city for a few years now. Doesn’t it look atmospheric? Ruby had no idea what to expect from her trip to Budapest, but a strange man in her bed on her first night probably wasn’t it. Once the mistake is ironed out, though, and introductions made, she finds herself strangely drawn to the handsome Hungarian, despite her vow of holiday celibacy. Does Janos have what it takes to break her resolve and discover the secrets she is hiding, or will she be able to resist his increasingly wild seduction tactics? Against the romantic backdrop of a city made for lovers, personalities clash. They also bump. And grind.